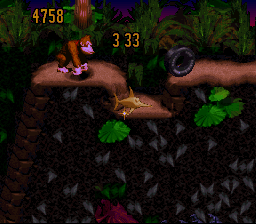 The Donkey Kong Country Competition Cartridge was used in the Powerfest '94 championship finals, as well as in the Blockbuster World Video Game Championships II in 1995 as a qualifier. Afterwards, the carts were sold in the Nintendo Power subscriber catalogue. Since only a limited amount of these were produced, it is a rarity. The Donkey Kong Competition Cartridge is a special timed version of DKC where you have five minutes to collect as many points as possible. 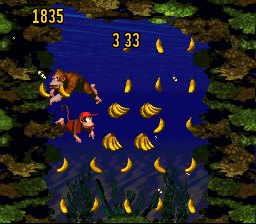 It was first used in the finals of the Powerfest '94, a week before the release of DKC in stores. In 1995, Blockbuster Video carried the Blockbuster World Video Game Championships II, which was sponsored by Gamepro Magazine, Acclaim, Marvel Comics and Nintendo. There was also a Genesis competition cart for this tournament, which features NBA Jam Tournament Edition and Judge Dredd (this cart is insanely rare, and only four or five copies are confirmed to exist). The people with the top scores from both of these carts went on to participate in the world championships. After the competition ended, the carts were sold through Nintendo's Super Power Supplies Catalog. The cart came in a plastic green rental-style box. The box states that the high score from the Nintendo pros was 3641. The box also says only 2500 copies were made, making this one of the rarest official SNES releases. The cart label itself looks pretty much like a standard DKC cart, except the corner has a display saying "Competition Cartridge". The top of the label states "Resale/Rental of the Game Pak is Prohibited!". This game is highly sought after by SNES collectors, and it fetches the highest price out of any game. Copies with the box usually sell for more than $500 on Ebay (I personally paid $650 for my copy back in the spring of 2008). The Blockbuster World Video Game Championships II happened during the summer of 1995, with over 300,000 people participating around the world. The preliminary rounds occurred in Argentina, Australia, Brazil, Canada, Chile, Mexico, New Zealand, United Kingdom, United States and Venezuela. Blockbuster held the preliminaries in June and July 1995 (sign-up was between May 25 and June 25, competitions happened between June 14 to July 9). Winners at the store level were given a years worth of free game rentals, while all participants got trading cards. Interestingly, in the guide to the tournament in the June 1995 issue of Gamepro, the editors were obviously not given the actual DKC competition cart, and it shows screens from levels not in the special version. The final round involved a head-to-head match of Batman Forever (what a game to use for the finals). 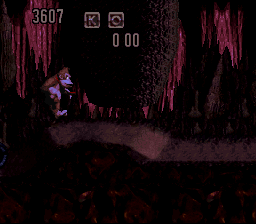 In the end, Ricky Frazier won the Genesis category, while Leon Kane won for the SNES. 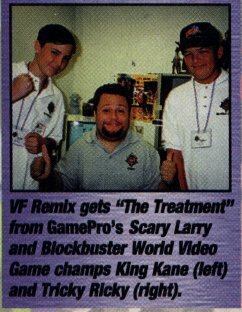 The winners got a $5000 scholarship or savings bond, and got to review Virtua Fighter Remix in the December 1995 issue of Gamepro. Other participants were given the opportunity to play games released in late 1995. Other events during the weekend included a tour of Alcatraz Island, a visit by Hakeem Olajuwan, and a tour of the offices of Gamepro Magazine. Now, onto the DKC Competition Cartridge itself. 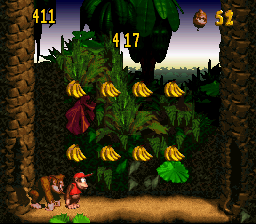 In this version of DKC, there is a points counter and a five minute time limit. Once the five minutes are up, the game literally freezes (presumably so the judge could record the score), and the game must be reset to start over. For the most part, the levels in the Competition Cartridge are identical to the ones on the standard release. The treehouse and banana hoard cave rooms at the start of Jungle Hijinx were disabled (presumably due to the time waste it would be to go in them). The animal tokens were mostly removed, though a few remain in the later levels. Without cheating, it is impossible to actually collect enough tokens to get to the bonus rounds (if you use the freeze timer cheat, you can get the tokens, but entering a bonus round resets your score!). 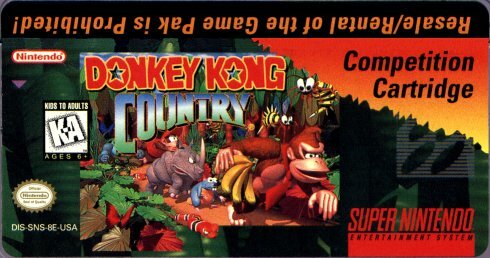 The Donkey Kong Country Competition Cartridge is an interesting piece of video gaming history. It was produced in small quantities, making it heavily sought after for video game collectors. 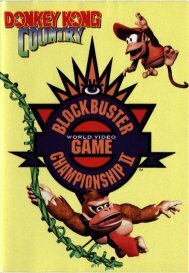 The Blockbuster World Video Game Championship II was a major video game competition that has not really been replicated since, and it was neat that Nintendo released the competition cart afterwards. The scoring system would have made for an interesting game mode in the standard release. Me getting a score of 3607. Scoring higher than the "pros" at Nintendo (3641) is definitely doable.